Let the rubber hit the road when you have our team install quality tires in Westerville, OH. Wayne's Auto Repair provides tire replacement as well as new wheels and tire alignments. Our ASE-certified mechanics do what it takes to extend the life of your car and help you enjoy a smooth ride. Have you noticed problems with your steering? If your car is shaking while you drive or it is creating more "road noise" than usual, you could need new tires. Inspect them to see if there are worn areas on the tread. Or bring your vehicle to our shop for a comprehensive tire inspection. We carry quality and affordable tires of all brands. Are your wheels worn out? Improve the value and appeal of your vehicle by letting us install a new set of wheels. It's amazing what new wheels can do to give your car a lift—literally and figuratively! We offer discount prices on many of our products as well. From affordable to high-end wheels, we can install anything you want. Don't wait days to get tire replacement. We provide prompt attention to your needs as well as fast services. Whether you have a flat or you need new tires, we are at your service. We'll replace one tire or all four. Prevent a blowout on the highway by relying on our mechanics to check your tires and determine if you need replacement. One way to tell if you need new tires is to take a penny, turn it upside down, and a place it in several tire tread grooves. If you can see the top of Lincoln's head, you need to replace your tires. 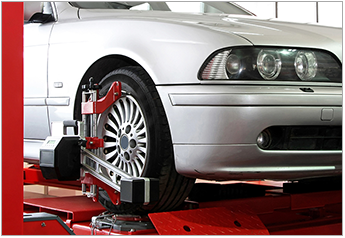 Ride smoothly again by bringing your car in at the first sign of alignment or tire problems. Contact us for auto alignments when you're driving crooked. We serve vehicle owners from Westerville, Columbus, Worthington, Gahanna, and New Albany, Ohio, as well as the surrounding areas.